John D. Mack and A.C. Blinn founded the Ohio Structural Iron Company in 1901, after they purchased the Crandall Iron and Fence Company, located on Warren Street in Sandusky. 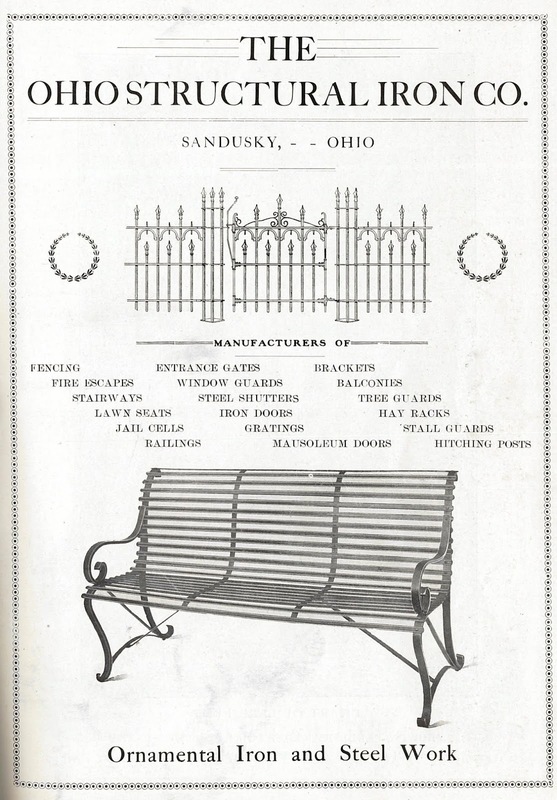 These advertisements, the one below from an early issue of Park and Cemetery and Landscape Gardening, let us know exactly what types of products were made by the Ohio Structural Iron Company. 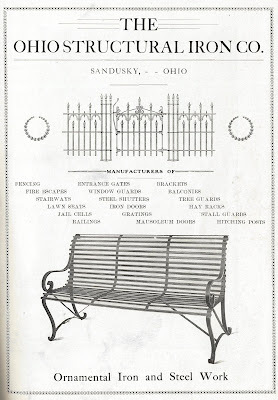 In 1903, the Ohio Structural Iron Company manufactured 200 lawn seats for the parks of the city of Toledo, and 100 lawn seats for the National Soldiers’ Home in Dayton, Ohio. The company built a fire escape that could fold up like an accordion for the Donahue building in Sandusky in 1905. 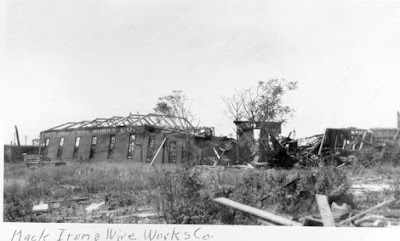 After John D. Mack bought out Mr. Blinn’s interest in the company, he changed the name to Mack Iron and Wire Works. This company got a contract for building an iron fence around the Confederate Cemetery at Johnson’s Island, according to an article which appeared in the September 2, 1912 issue of the Sandusky Register. The fence was four feet in height and had ornamental posts and arched gates. A tornado seriously damaged the Mack Iron and Wire Works building in June of 1924. In 1925, as the company was re-building, John D. Mack hired his son-in-law to manage the Iron Works, so he could devote more time to the Sandusky Register, where he served as Vice-President and Treasurer. Having weathered setbacks during the Great Depression, in the 1940s, Mack Iron made defense materials in support of the U.S. War Effort. So many of Mack’s regular employees went off to serve in World War II, that to keep up production the company brought in German prisoners of war from Camp Perry to work on the lines. After the war, Mack Iron moved from foundry work to metal fabrication. 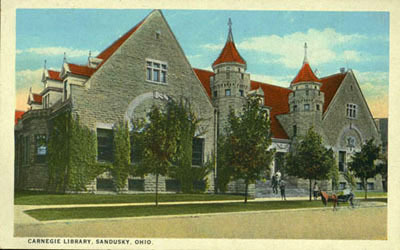 A lengthy article in the April 22, 2001 issue of the Sandusky Register reported that projects made by Mack Iron can be seen at Sandusky City Schools, the Erie County Jail, the County Parking Garage, a coaster at Cedar Point, and many other area buildings. 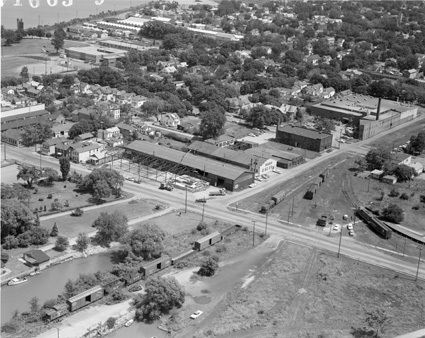 An aerial view of Mack Iron, taken by photographer Thomas Root in the summer of 1965. We had one of the Mack Iron metal benches in our back yard patio when I was growing up on Fifth Street in the 40's and 50's. The bench is still in the family, now in the back yard of my brother John and his wife Ann, in Perkins Twp.